Books rule my world and that's how I like it! I can’t say I’ve read lots of books by Bernice L. McFadden. Actually I’ve only read two, Glorious and Gathering of Waters. Glorious was a story about a Harlem renaissance writer, which I enjoyed until it ended abruptly and left me searching for more. 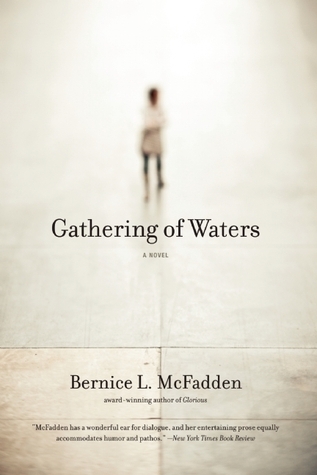 I embarked on Gathering of Waters for three reasons; 1. because it was written by Bernice L. McFadden, 2. because it was the 2013 Clutch Reading group on Goodreads title choice for the month of May, and 3. after I read the inside flap of the book with this stunning cover, I was immediately sold and knew I had to read it. The story basically follows three generations of women from 1900 to 2005. So, it covers life leading up to the week before Emmett Till is murdered and goes on beyond that. I found this story beautifully recounted and that dash of magical realism that makes the entire story come to life unexpectedly. There are a range of engrossing characters who are defined and developed perfectly. The book isn’t very long so McFadden was successful in depicting the characters in particular situations and with rich, moving, and sassy dialogue. Gathering of Waters, has that bold, direct storytelling style that makes African-American literature so thought-provoking. It’s stuffed full of excellent one liners that mean so much. Now I have to mention the debate I’ve been hearing about the usage of Emmett Till in the story. There are people out there who think McFadden is using the Emmett Till murder to plug her book. I can see how people would think that but it’s not the case. If you read the inside flap of the book, that is basically a short synopsis of the story that you will be reading. What McFadden does is set Emmett Till in a real space of life so that he becomes more than just a murdered young black man. There was a before, a now, and an after and McFadden explores all that. The fact that she decided to write this book is also edifying. There are people out there who don’t even know who Emmett Till was and I’m not just talking about white people. This incident was one of many stains on American history that hasn’t made it in the history books. How did I learn about that tragic night for Emmett Till? - Of course from my mother and my grand-mother. Oral discourse, the oldest way to pass on family traditions, history, and cultural habits. Gathering of Waters is a perfect example of that. Money, Mississippi is the narrator. It lets you in on all the workings and secrets of this microcosm. The ‘gathering of waters’ is more than a place that’s squashed between bodies of water, a place called Mississippi. It is also symbolic of that fine line that separates blacks from whites. It is the place where they meet like bouncing molecules off one another. They come together for a moment only to separate soon there after.